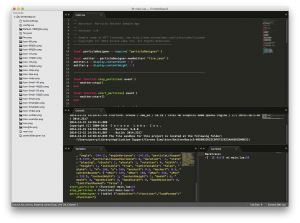 We’re excited to announce that a new version of Corona Editor (our plugin for Sublime Text) is out and ready! We’ve added some new features and squashed quite a few bugs (how’d they get in there?) to make Corona Editor better and your workflow even faster. The main improvements are to completion and the debugger. Completion now handles periods in items much more smoothly and has additional features like optional removal of whitespace (which was submitted by a Corona user – thank you!). The debugger now has much improved display of variable values and handles multi-directory projects much more seamlessly. You can find a complete list of changes here. Check out the forum post for more links to useful info. Since feedback around this can get technical, we’ve closed comments on this post – please post feedback/comments to the forum thread.